I took Ellie to the doctor today for a check up, and she’s doing great! She still has a slight murmur, from the ASD. We go back to the cardiologist in December for a check up. (We last went when she was 6 months old.) Otherwise, she’s a regular long, tall Sally in her stats. 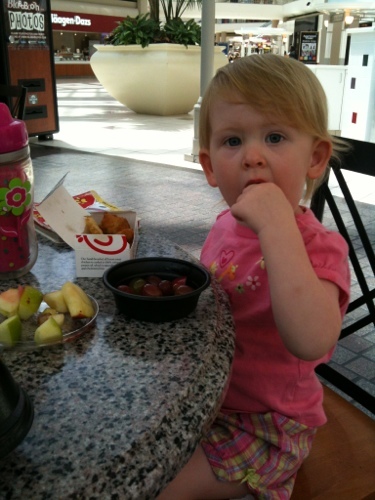 We took her to the mall for lunch and to Build-a-Bear afterwards. She was so happy looking and picking out animals. (And I think her favorite color might be purple from all the purple things she picked out.) We were going to go all out and stuff an animal, but decided to get a smaller one that was already stuffed. It’s a purple giraffe. Neato. Hope she enjoyed my favorite meal!